You can purchase advance tickets from Ticket Web. Get them while you can before the show sells out. Check out this youtube link for an amazing performance from Barrence and an interview. We've just confirmed it! 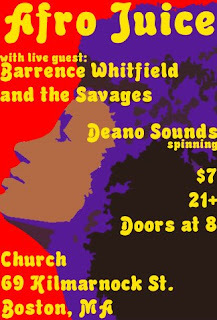 On June 29th Afro Juice will be host to Barrence Whitfield and the Savages. Barrence Whitfield's performance is a howling explosion of vocal energy that funnels the true grit and style of R&B, soul, blues, and roots rhythm. Barrence has played with or opened for such stars as: Bo Diddley, Tina Turner, George Thorogood, Robert Cray, The Reverend Solomon Burke, Los Lobos, Taj Mahal, Richard Thompson and many more. For more information on Barrence go to his website at http://www.barrencewhitfield.com/.